Maria and Lily are roommates at Acheron, an exclusive private school on the grounds of an old Southern plantation. They’re also head over heels in love with each other, even though they’re keeping their relationship under wraps. Both girls want to continue their relationship in college, but the only way they can do so is if Maria wins the coveted Kingsley Prize - a scholarship that will let her attend the college of her choice at no cost. Maria is second in the class, and Delilah, number one, is just slightly better than Maria in every way possible: more popularity, more extracurriculars, better grades. Even with all the extra credit in the world, Maria’s GPA won’t top Delilah’s. So the girls have to get rid of Delilah. And they know no bounds. Lily buys an old wooden Ouija board off eBay and holds a seance with Maria, whose belief in spirits was instilled by her Hispanic nanny. The girls use the board to open the door to the spirit world - then forget to close it. This twisted retelling of Macbeth is delightfully creepy and unsettling. The atmosphere the story creates is dark and spooky, and the suspense builds while the reader wonders what havoc the spirits will wreak on campus next. The history of the slave plantation on which the school is built adds depth to the story. 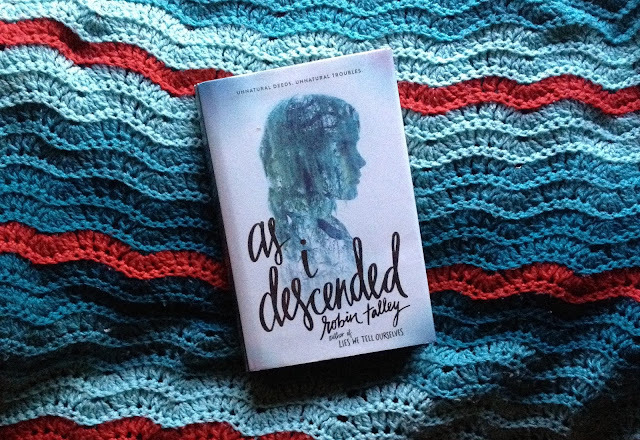 I loved Talley’s first book, Lies We Tell Ourselves, but wasn’t sure what to expect from her supernatural book. I don’t usually read supernatural stuff, but since I love her writing style, I wanted to give it a shot. I’m SO glad I did. This is the ghost story to end all ghost stories. It’s a very literary, very beautiful book. I would read anything by Talley. I also reviewed this book for Memphis Reads. 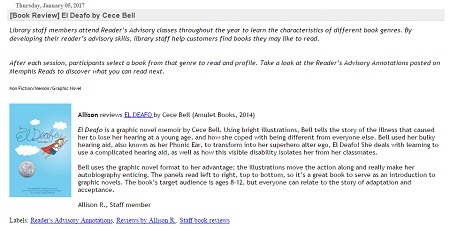 the library's book review blog. Please check it out here! 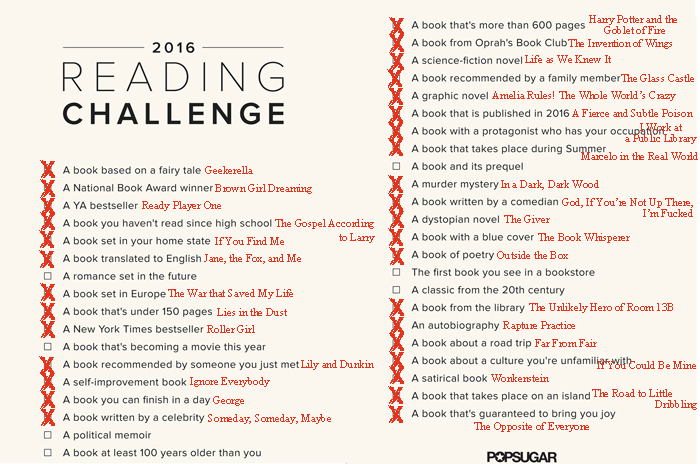 I did the PopSugar Reading Challenge for the second time this year. (See 2015’s Challenge here.) I start off by reading whatever strikes my fancy, then looking at the list to see what it qualifies as when I’m adding it to Goodreads. In November, I decided I’d actually use the list as a Challenge, and picked out books specifically to fit criteria I hadn’t yet met. See 2016’s Reading Challenge here. I’m going to tackle this year’s list as more of a challenge, and look specifically for books that will help me mark off the list. I’m sure there will still be some books I read just for the fun of it that will qualify for the challenge, but I want to read a bit more widely this year. I love a good reading challenge, whether it’s a loose goal of how many books to read in a year, or a more structured goal of what books to read in a year. I’ve been doing the Goodreads challenge since 2012, which is just a number of books to read. 2012: 125/120 - I went above and beyond, so I upped my goal for the next year! 2013: 92/125 - I was well below my goal. That's what I get for being smug and determined. 2014: 110/100 - I went a little bit above, but kept my goal in check for the next year. I learned my lesson. 2015: 141/100 - Well above my goal, which kind of amazes me because my course load was really heavy this year. 2016: 140/100 - Well above my goal again; also surprising since I finished up my MLS and adjusted to a new full-time job. 2017: ?/104 - My friend’s 2016 goal was 104 because that’s 2 books a week, and I like that logic. I don’t usually do too well if my goal goes over 100, but let’s try it! 2016: 273/200 - This doesn’t include the books my son hears at school; his teacher loves to read to the class! We try to read 2 books a night, sometimes reading more, and sometimes skipping storytime altogether if we’re running late with bedtime. A lot of the books are the same book over and over (coughDoCowsMeowcough) but I only counted the new books read, not how many times we re-read old favorites, so he did great! 2017: ?/250 - I want to keep the goal of reading 2 books a night, but try to miss fewer nights. I wanted to bump the goal up to 300, but considering re-reading so many favorites, I’m not sure we’d make it! This gives us a little wiggle room so we can still read 2 books every night, but not have to push to hit a goal. Do you sign up for the Goodreads Reading Challenge? How many books did you read this year? What's your goal for next year?